Enjoy your night with one of the fastest network in Nigeria. Infact, Etisalat is the fastest network when it comes to browsing and streaming videos online. Their night plan is cheap and affordable and can be purchased without feeling the pain because it doesn't zap. Meanwhile, Airtel still has the cheapest night plan but can't be compared with the speed. 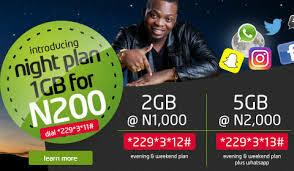 So this Etisalat night plan can be used in the night only and can also be used on Computer, PC, Game consoles, Tablet, iPhone, iPod, Desktop, Modem and many other devices that can access the internet. It is easy and simple. Just go to your phone dial pad. Then dial *229*3*11# and your night plan will be activated successfully. It lasts from 12AM till 5AM in the night. Just activate your night plan on your smartphone and insert the sim card into your PC modem and switch on your data connection then start browsing, downloading and streaming.